My friend (and the designer behind this little blog), Susan, is about to embark on a kitchen renovation project. As a pre-demolition kick-off, she had a little “before” brunch at her place. While we weren’t pressed into service with sledge-hammers, she did have some work in mind for us. 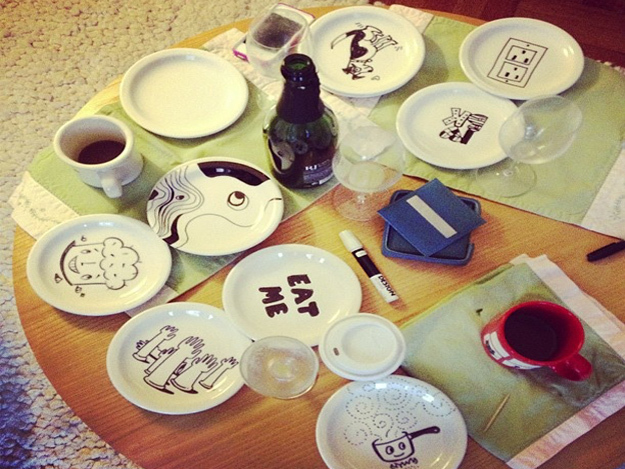 Susan set out stacks of simple, white side plates, black permanent markers and directed us to grab a plate and draw–anything, whatever doodle sprang to mind. 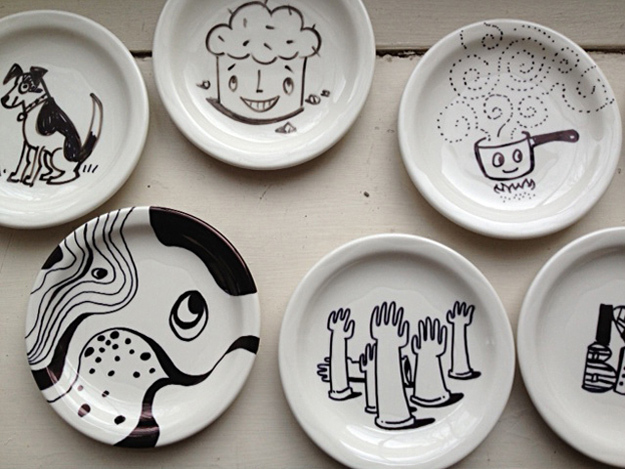 Inspired by James Victore‘s “Dishes Dishes” series, Susan plans to display these mini works of art in her newly renovated kitchen. Even those claiming zero artistic ability had fun with it. And no need need to be gutting your kitchen as reason to take pen to plate either. This would be a perfect project for artists of all ages. Pick up small plates in various shapes and sizes. You can add pop with permanent colored markers. Design keepsake dessert or appetizer plates to use all year, or pack them away for special occasions. Or, give your kitchen a mini-update by displaying your very own dish exhibit. Insta-artwork! This entry was posted in create and tagged Crate&Barrel, Fishs Eddy, Ikea, James Victore by lhouse. Bookmark the permalink. If she bakes them, they’ll be permanent and she can use them!